QUOTE: "I will prove to all of Japan that the Naginata is a MAN'S weapon. It is superior to ANY sword." Goroshi rejected the notion that the samurai sword was the perfect bladed weapon for combat. 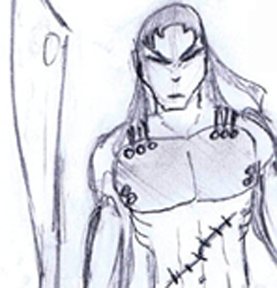 He insists that the finest bladed weapon is that of the Naginata - similar to a spear, but with a broader cutting edge. Many fighters maintain that the naginata is a woman's weapon, a notion that Goroshi finds infuriating. Determined to prove the worth of his beloved weapon, Goroshi roams the countryside in search of swordsman to face in combat. Goroshi claims to have killed over thirty swordsmen with his Naginata. 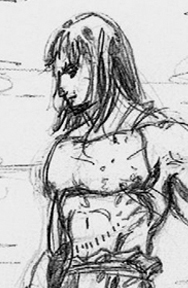 He once made this boast to a sword-bearing fisherman, who turned out to be Ori of the legendary Junichero clan. 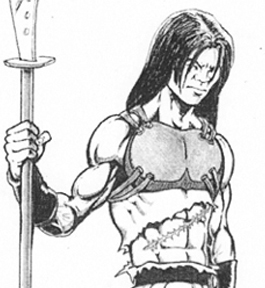 Ori's blade cut the naginata in half, and left Goroshi nearly dead - his belly sliced open. Though his injuries were severe, Goroshi survived. Now bearing a huge scar across his abdomen, Goroshi has set out to find Ori Junichero once more... and to settle the score.